1. VoiceOver may be turned on in Accessibility Settings under Vision. 2. Alternatively, VoiceOver can be activated and deactivated by triple-clicking the Home Button, but this must be turned on in Accessibility Settings under Triple-click. This is referred to as the "Accessibility Shortcut" in iOS 7. 3. When VoiceOver is turned on, multiple settings and adjustments are available. a. Speak Hints may be turned on or left off. c. Typing feedback may be set for the onscreen keyboard, or for external keyboards. Settings include: Nothing, Characters, Words, Characters and Words. d. Use of Phonetics may be switched on or left off. e. Use of Pitch Change may be switched on or left off. f. Use of Compact Voice may be switched on or left off. (A more natural voice downloads and installs the first time device is connected to power and wi-fi. g.If a Braille keyboard is being used, it can be set for Contracted Braille of Eight-dot Braille. If the Status Cell is turned on, it can be set to the Left or Right. h. The rotor is a special set of gestures unique to VoiceOver. 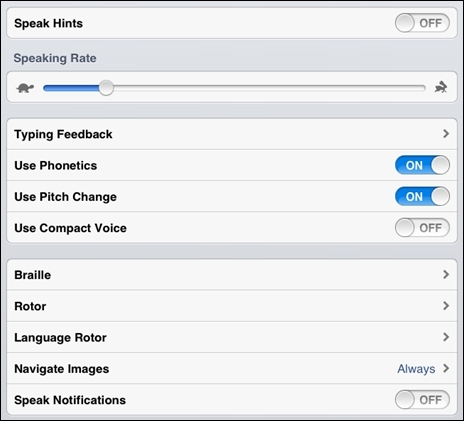 For more information about rotor settings, see Apple's Online Guide to VoiceOver on the iPad.